Interpreter is a collection of nine short stories about life, the banality of human nature, and the stories that do happen in normal everyday life, if we look close enough. There's the couple who lost a baby and couldn't get things together again. There's the man who came to dinner every night and you never knew that you could miss him until he was gone. There's the poor stair sweeper taken for granted by a community who could do no wrong in their own eyes. What I love about her stories is that the situations are universal; the characters just happen to be Indian. There's an ease and simplicity in the way she writes, and she has the ability to focus on the complexity of situations in life in a light, easy way. There's no Amy Tan-ness about her book. It's very much what you see is what you get, which is very refreshing. 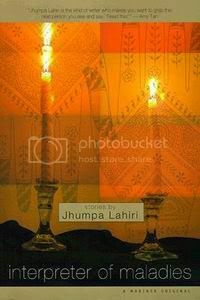 I can see why Jumpa Lahiri won the Pullitzer Price in 2000 for this.